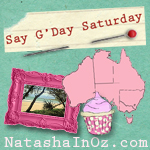 Welcome friends to this weekend's Say G'day Saturday Linky Party! This week I have found some great crafty ideas. Halloween is coming up soon and there are so many great ideas being pinned already. Look at this! What have you been blogging about this week? If would like to join in with my weekly Say G'day Saturday party, just link up the url of the post you would like us to visit to the linky tool each weekend. Thanks so much for stopping by and I hope you enjoy this #TuesdayTune all about unleashing our creativity to take you into the weekend. Let the sun illuminate the words that you could not find. I must be a trend setter ;) When I was 14 I started a jewellery stall at the markets and I printed my 'logo' on paper bags. I did it last year for a Halloween party too! Easy and looks great. Those printed bags are so nice! great idea. Cute features! I could link a Pinterest post I did a couple of weeks ago if that's ok? This is a fun idea for the new "addiction". Hop you will link to the Potpourri Party next week! Thank you so much for visiting my blog, I wouldn't have found you if I hadn't! I'm now your newest follower too! The crafts are so neat, I love the lunch bags and the Halloween pumkins made with a roll of toilet paper! I'll have to read more about the pinterest party...so neat! I am visting your blog for the first time and its awesome! BTW I came here from Pinterest! I love to pin! I am a follower of you now. My favorite paper pack from My Memories is in this moment "Boo Too" by Lindsay Jane. You have such a cheery, upbeat blog, I am a new follower. Loved all the crafty things today. Oh my! So many pretty things from pinterest. I've joined but not done any pinning yet. I love the canning jars and the pumpkins are so pretty. I'm visiting for Pink Saturday. I'd love to have you pop in for a visit. I love the mason jar craft storage. that craft "room" is lovely and I also love the pumpkin decorating ideas!! You are blessed to have such talent to create these pretty things. I missed the boat when they handed out a creative mind. I want to try so many of these ideas, but especially want the craft desk. Fun! Ooooh, my faves are the bell jar storage and the amazing closet craft area! Hey Natasha! Love the painted pumpkins - the old many floors house reminds me of Pennsylvania. I went over to My Memories and liked Batter Batter Strike (think that was the title!). Our grandson is really into baseball. In fact, Doug (hubby) is taking grandson and his dad to see the Cincinnati Reds play tomorrow night! I'm a longtime follower of yours. I'm now following My Memories on Twitter. Gave a thumbs up to My Memories on Facebook. Mentioned your giveaway in my Pinning and Singing post. Hi Natasha, how are you? Been watching your "Pinning and Singing" linky party for a couple weeks now but never enough time to submit something. I've done it today. Thanks for having me. Also, I've printed colouring pages on brown paper bags for the kid's loot bags and a few colouring pencils, lollies etc and they've gone down a treat. Have had enough of the rain this week and am ready for Spring. Love the printed lunch bags! I'm staying away from pinning...I have a hard time managing my computer time as it is! Lovely ideas, though. Love Pinterest and I am following you here and there! Love your pins! Pinning and Singing, great combination! I love the ribbon on the spool in the jar idea. Off to put all my ribbon on spools...Thank you so much for the inspiration. thank you for lots of inspirations. All those people are really creative. what a fantastic post! I love all of the showcased ideas. I am in love with the craft space..
Hi Natasha!! Oh, I loved this post! I love digital scrapbooking. Well, I haven't done any since I've started blogging! :) I do love to scrap and have quit a lot of albums. I'll have to go and check out that site! im crazy about pinterest too! i do love browsing for ideas and pin them on my board so i know what i'm going to do hehe..lovely ideas there! Martha's Shell Koala are, or course, darling..., but what a cool idea to print on bags!!! I visited My Memories and was amazed by their huge selection. I'll have to admit that I know nothing about digital scrapbooking. My favorite paper was Harvest Pickins. But I have been pinning like crazy lately. Glad to know that you're hosting this party. Thanks for hosting this fun event each week, Natasha. I adore Natasha Beddingfield. I have my ribbons on wood clothespins in jars, too.